In Colorado, teen drivers must pass the written driver’s permit test to obtain a learner’s permit, which they then must hold for 12 consecutive months before applying for a driver’s license. To get a learner’s permit, teens under 15 ½ years are required by law to complete a 30-hour driver’s education course from a state-accredited driving institution. The driver’s permit test in Colorado quizzes takers on the topics covered by the Colorado Driver Handbook, which include road signs, DUI, safety rules, and Colorado driving laws. To prepare your teen driver for the exam, this article will tackle what every driver must be aware of: traffic signs. 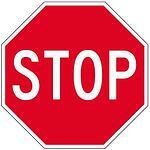 A stop sign warns drivers to make a complete stop and ensure no cars are coming before proceeding. A yield or “give way” sign signals drivers to prepare to stop, if necessary, and let a driver on another approach proceed, essentially yielding the right of way to the other driver. A left turn is illegal where a “no left turn” sign is situated. The only other options available to you in this scenario are either to turn right or go straight ahead. 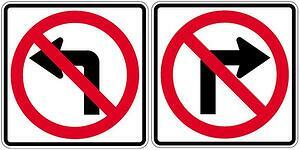 Similarly, a “no right turn” sign prohibits making a right turn. Instead, travel straight through or turn left. You make a U-turn when you need to travel in the opposite direction. 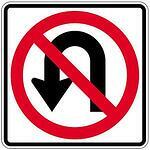 “No U-turn” signs are usually found on one-way streets. They are also put where performing a U-turn is unsafe, such as where traffic is brisk and you are likely to hit (a pedestrian or another vehicle) or be hit. A “left turn only” sign indicates you can only execute a left turn but not a U-turn, the same way you can only make a right turn where a “right turn only” sign is visible. You cannot drive through or go straight. 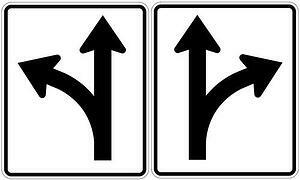 The “straight through only” sign says what it exactly means: no left or right turns, just go straight through. A “left-straight optional lane” sign warns of lanes that allow drivers to either turn left onto an adjacent road or go straight across traffic. The “right-straight optional lane” indicates basically the same thing, this time of a lane where you can either turn right onto an adjacent roadway or go straight ahead. The “do not pass” sign marks the start of a no-passing zone, where drivers cannot overtake other vehicles. 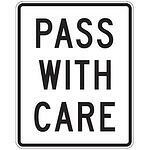 The “pass with care” sign indicates you are in an area where it is safe to pass other vehicles, provided you exercise caution and common sense. 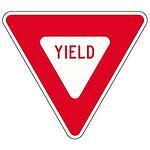 In multi-lane highways, this sign is used to discourage unnecessary lane-changing. Drivers must keep right unless passing slower-moving vehicles, or if they intend to make a left turn. 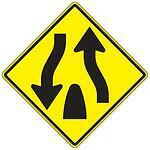 The “keep left” sign warns drivers that a traffic divider is up ahead, and to keep to the left of the roadblock. The “keep right” sign warns the driver of a traffic island or highway divider ahead, and tells him to stay to the right of the roadblock. 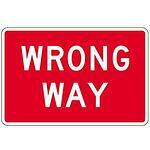 When installed on a highway, the sign usually comes with the “divided highway begins” warning sign. 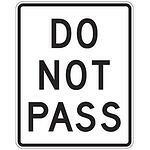 The “do not enter” sign can usually be seen at roadway openings with one-way traffic that is against you. 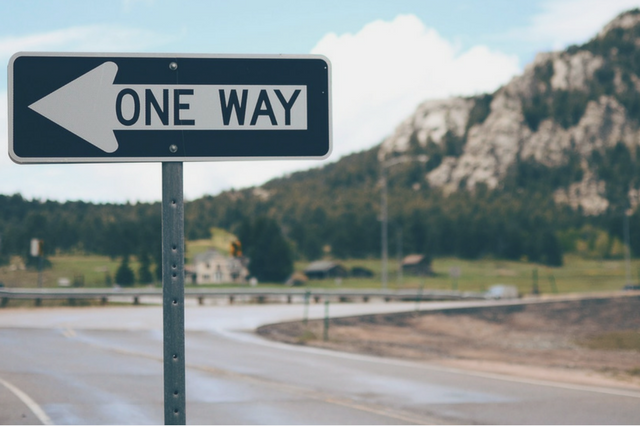 Much like the “do not enter” sign, the “wrong way” sign alerts you to the fact that you are traversing a road you should not. 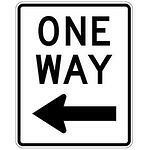 The “one way” sign warns drivers that they are crossing a one-way street. The “divided highway begins” sign warns motorists that the highway ahead is divided into two separate one-way roadways by a media strip or barrier. As such, keep right. 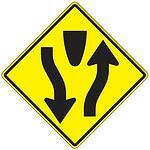 This sign indicates that the divided highway you are driving on is ending and to expect two-way traffic ahead. 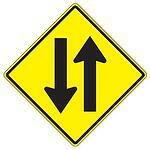 The “two-way traffic ahead” sign signals that you are leaving a one-way street and entering a two-way roadway. You are not allowed to park wherever a “no parking” sign is installed. 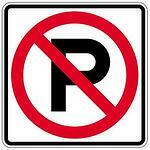 Additional pavement markings may be used to communicate parking restrictions in the area. 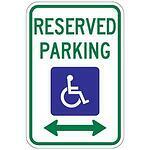 A “reserved parking” sign is installed on parking areas reserved for disabled drivers. Authorized registration plates or a special parking placard must be displayed on vehicles parked in such areas. 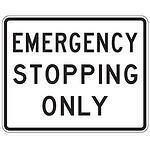 Areas marked with the “emergency stopping only” sign are for real emergencies only, such as a medical emergency or when your vehicle experiences engine or technical troubles that can jeopardize your safety. 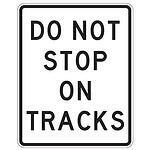 This sign warns drivers that they cannot stop on the railroad tracks for any reason. 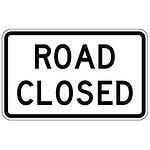 This sign simply means the road is closed to all traffic. Look for detour signs. 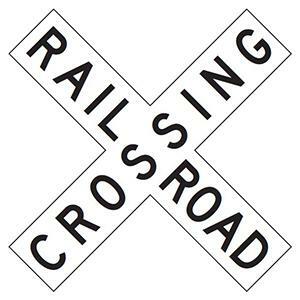 The railroad crossbuck sign is installed at railroad crossings, where the tracks and the road intersect. Slow down, listen for trains, and be ready to stop if you hear or see one coming. 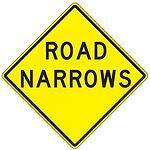 The “road narrows” sign warns drivers that the road ahead is not as wide as the one they are driving on. 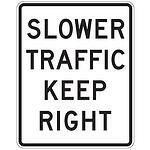 Drivers need to stay cautious to stay in the middle of their lane. 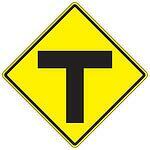 The T-intersection sign indicates that the road you are traversing is ending, and thus prepare to slow down or stop before turning. 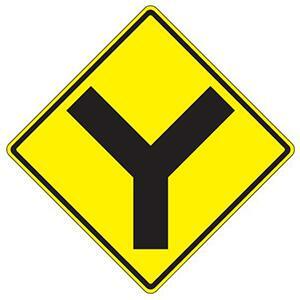 The Y-intersection sign warns drivers of a three-way junction ahead. Your teen driver must have a learner’s permit to begin supervised driving. Western Slope Driving Institute takes pride in its commitment to give your child the best possible driver’s education and training. Our instructors, who are mostly former law enforcement professionals, will help prepare them for the DMV-administered written and practical exams to obtain their permits and licenses. Call us today for any questions you may have or if you want to sign up your teenager in any of our courses.